Our final dinner during our week in Avalon ended up being in a place where it was not supposed to be, and that was OK. Here is what happened. Four of us had made reservations for a 5:30 P.M. table at The Diving Horse at 21st and Dune. 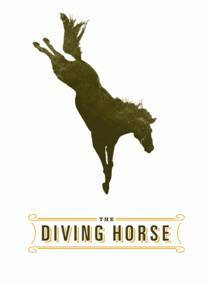 The Diving Horse is the new “IN” spot BYOB at the Jersey shore and draws great reviews and large crowds nightly. My friend, Gerry and I, screwed up during the afternoon while our wives were visiting the Rt. 9 antique shops. We had a Chicken Panini and a few beers at Harbor’s Bizarre (I love that name!) in Stone Harbor. Fearful that we had ruined our appetite for an early dinner, our wives insisted we move our reservations back to 7 or 7:30. At the same time, my wife’s sister, Pat, and her husband Bob decided to join us for dinner. When I called the Diving Horse to change the time I was informed the only time available for a party of 6 was 10:00 P.M. They informed us we were welcome to take our chances at an outside table earlier than that, but without a reservation. We certainly didn’t want a midnight snack and didn’t want to risk being shut out at the few outside tables so we cancelled and called the place next door to the Diving Horse, another BYOB named the Black Sea. I knew nothing about this restaurant but they happily took our 7:30 reservations. We parked on 21st. Street and walked past the throng of diners both inside and outside of the thriving Diving Horse. 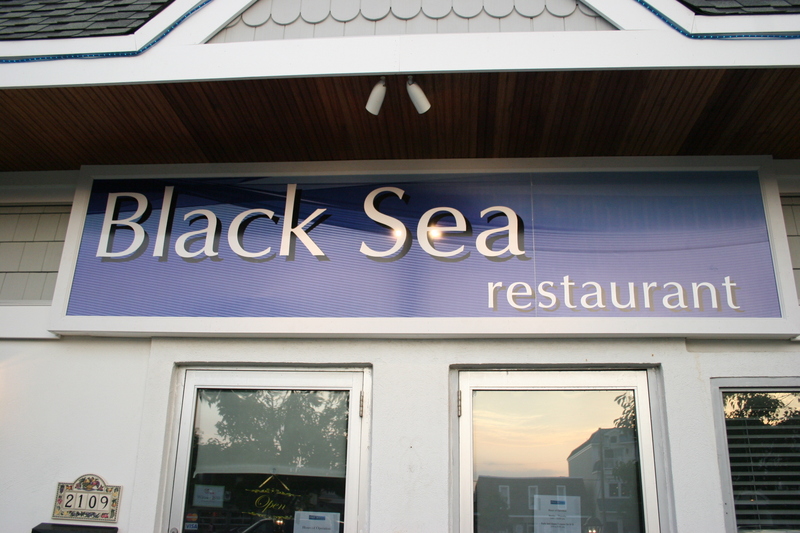 Upon entering the Black Sea we tried to be quiet so as not to disturb the ONLY other occupied table in the place. During our two-hour stay one other couple entered and, the truth is, that’s a shame because the Black Sea serves very good food at very reasonable prices. 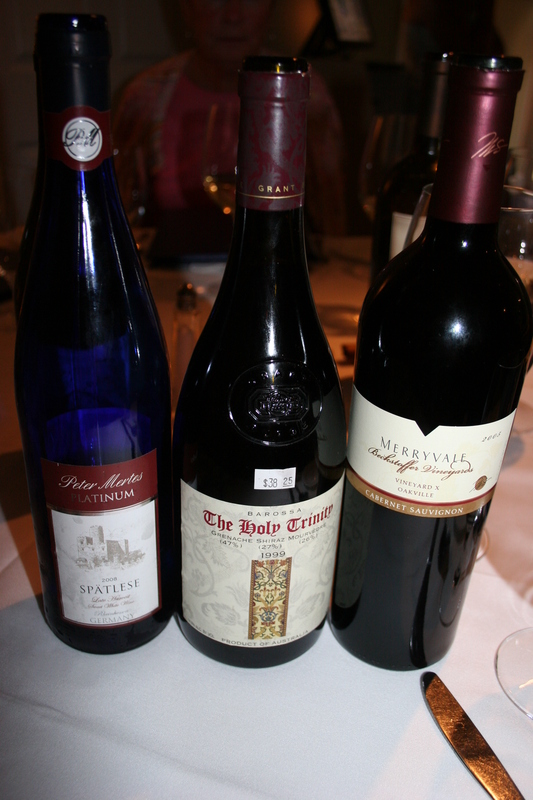 While our capable server, Ted, opened our wines, the six of us studied the interesting choices on the menu. There were some nice seafood items and a limited number of chicken and steak offerings. We even had a white wine with us this evening as Bob and Pat G. brought a 2008 Peter Mertes, Platinum, Spatlese, Rheinhausen, Germany. A little sweeter than the basic Kabinett it was still pleasant along with the fish selections. I dug into my cellar stash and came up with an Aussie version of the French Chateauneuf du Pape’s with a 1999 Grant Burge, “The Holy Trinity”, Barossa Valley, Australia. This 11-year-old beauty started out a bit dull in the glass before quickly opening up in both color and flavor, revealing a minty tang to the dark fruits. A combination of 46% Grenache, 27% Shiraz and 26% Mourvedre gave off great aromatics with licorice and lilac scents. It was drinking very well and gave no indication of heaviness despite its almost 15% alochol content. 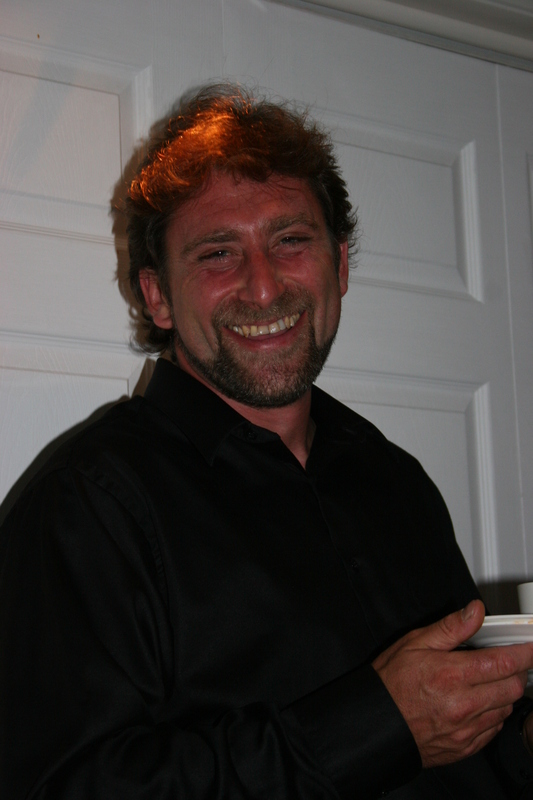 Gerry B., who is always content with a good California Cab had the 2005 Merryvale, Beckstoffer Vineyard, Vineyard X, Oakville, Ca. There are few vineyards in California better than Beckstoffer and this deep, dark, inky concoction which spent 24 months in French barrels prior to bottling did not disappoint. Tons of rick blackberry flavors with tones of leather and anise made this a great dinner companion. Lest I forget, there was food involved. 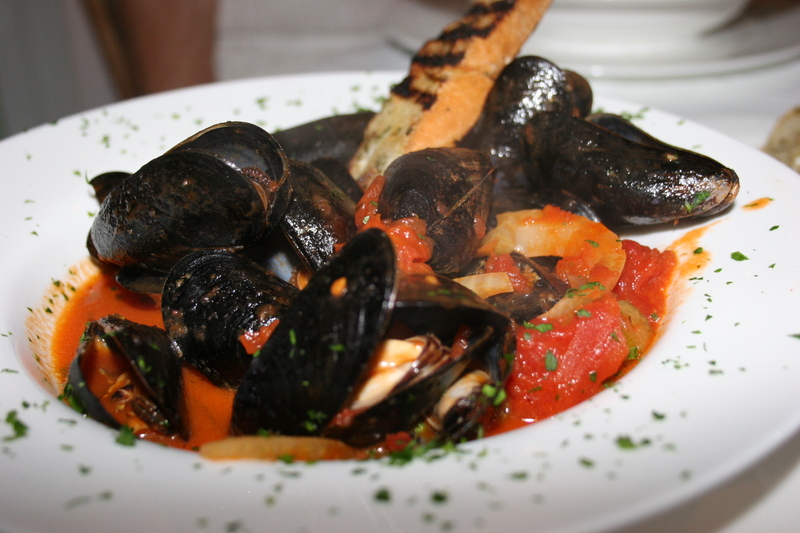 My wife, Kathy, had the Prince Edward Island Mussels, in a light garlic, tomato and fennel broth. She thought they were very good and used some of her bread to gather up the tangy juice leftover after the shellfish had been consumed. 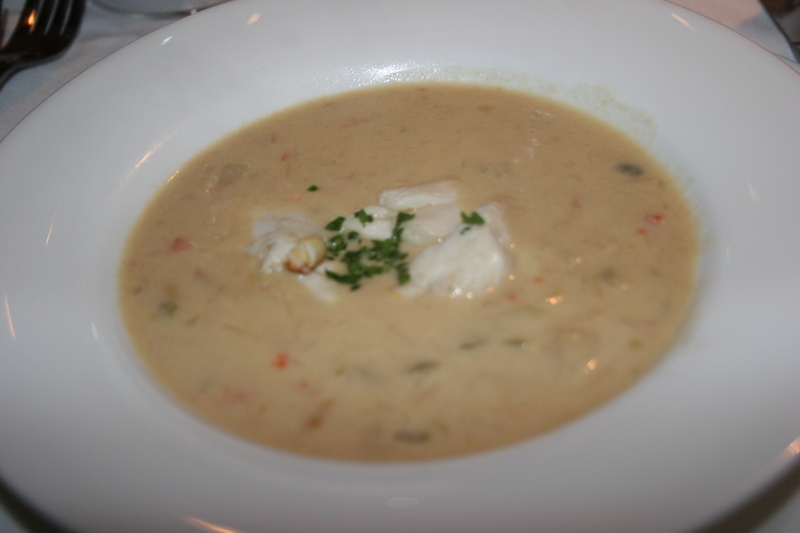 I had little trouble deciding on my appetizer once I spotted the intriguing Crab Meat and White Asparagus Soup, jumbo lump crab meat and tender white asparagus in a light cream made for a super marriage of tasty ingredients and provided my dinner with a great start. This was a really nice soup. 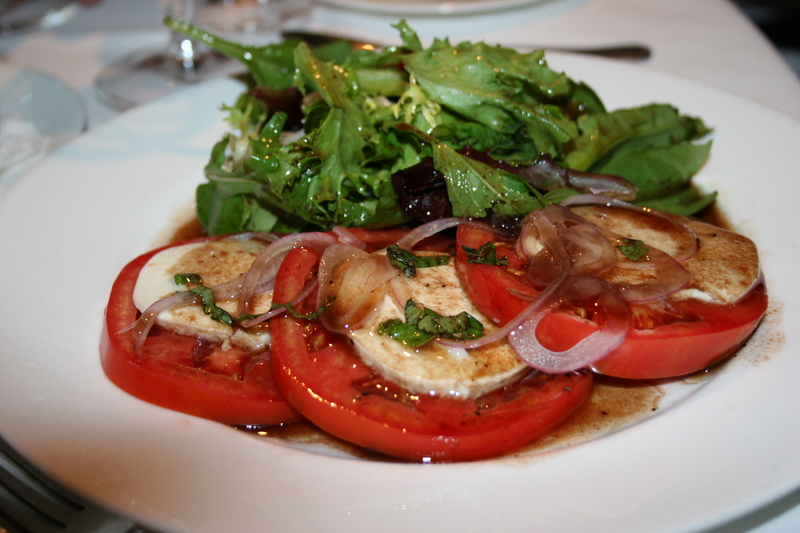 Gerry B. chose the Tomato Caprese and was quick to acknowledge that this one was leaps and bounds over the one he had the night before at Cafe Loren. Three nice large slices of room temperature Jersey tomatoes topped with tender mozzarella in a light balsamic vinaigrette quickly disappeared from his plate amid a few satisfying sounds of gratification. 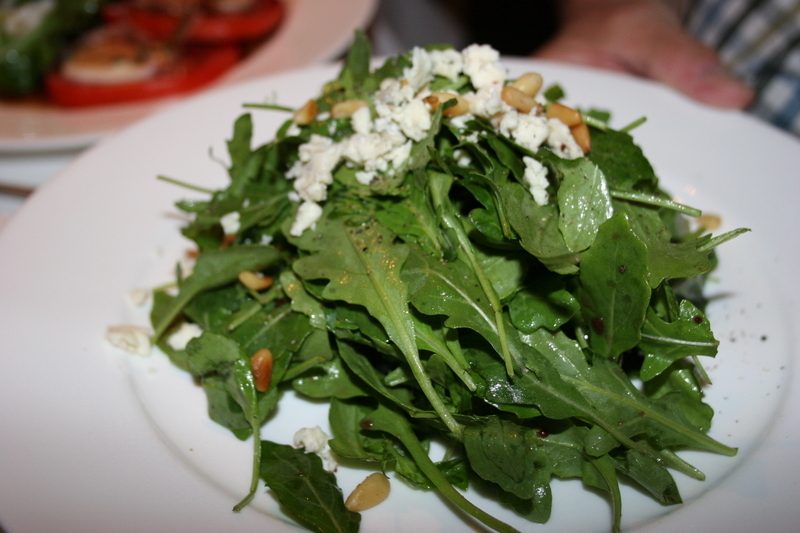 Those who zeroed in on the Arugula Salad had no complaints either as the fresh, baby arugula provided a delicious resting place for the blue cheese crumbs, pine nuts and raspberry vinaigrette. After two nights of fish selections, both of which I totally enjoyed, it was time to head in another direction. Kathy and I both selected the Chicken Embassa as our entree. For some unknown reason, I neglected to take a picture of the dish but you’ll just have to trust me that the pan sauteed chicken breast, topped with baby spinach, tomatoes and fontina cheese looked every bit as good as it tasted and Kathy totally agreed with my evaluation. Pat G. felt comfortable in ordering the tuna after Ted assured her it didn’t absolutely have to be rare. 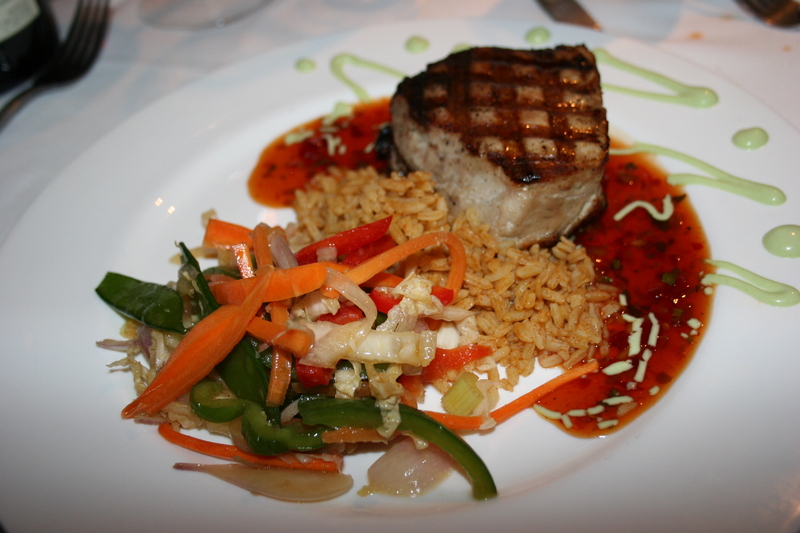 She had it cooked a little more than usual and her Grilled Tuna Steak with Asian slaw, sweet red chili sauce and wasabi was spicy and delicious. I don’t think I have ever ordered tuna for an entree so I was glad when Pat let me sample hers and it really was tasty. 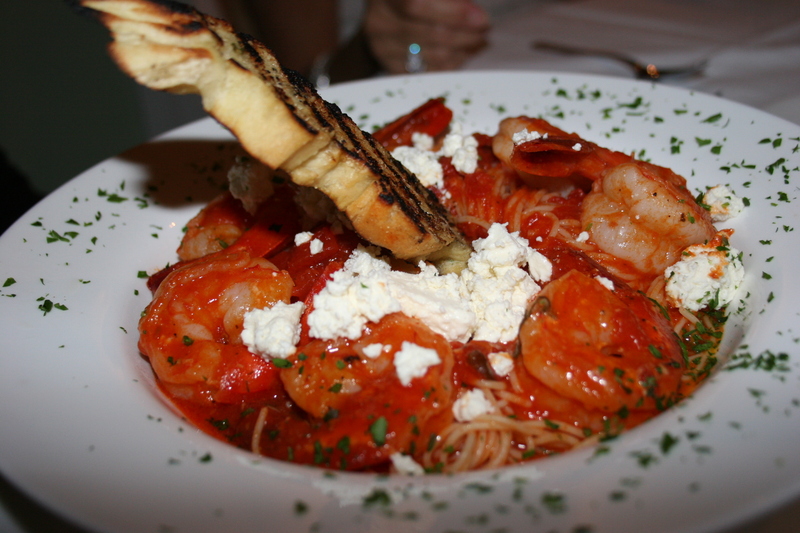 Gerry, JoAnn and Bob all went with the Shrimp & Bulgarian Feta, pan sauteed shrimp with house-made marinara sauce over angel hair pasta, topped with Bulgarian feta. The shrimp were cooked to perfection and the sauce was reportedly right on target and all three of them had rave reviews for their entree. I think we ordered a couple of desserts and six spoons not so much because we were still hungry but rather we were enjoying the wines and the good conversation and were trying to prolong the dinner. Although we were now the lone table in the Black Sea, Ted was putting no pressure on us to depart. 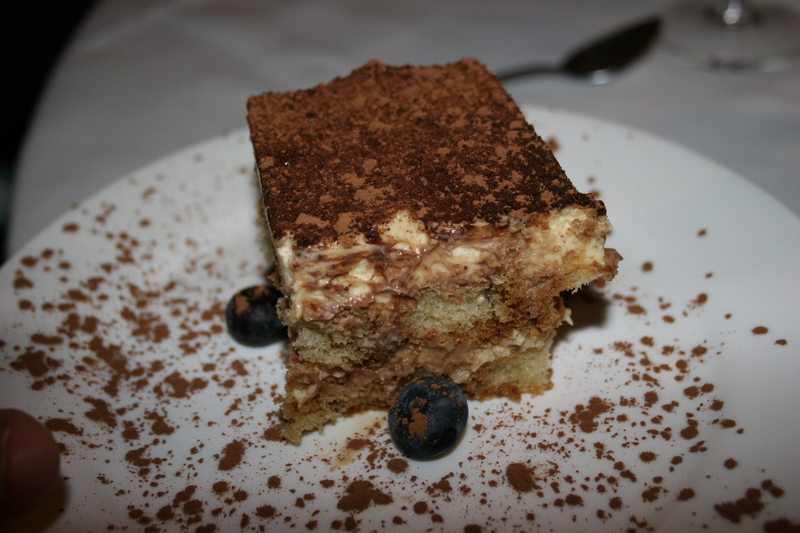 We all liked the Tiramisu but it was the other dessert that drew the ooohs and ahhhs and smiles of pleasure. The Avalon Swan was not only artistically pleasing but the flavors of white and dark chocolate, the ice cream torso of the swan and the yummy sauce on which the entire presentation rested made this one a sweet culinary masterpiece. The Diving Horse may be an excellent restaurant; certainly most of the reviews seem to indicate that diners are pleased. I can’t say because I haven’t been there. I do know the menu items are quite high and the few negatives that I have read all seem to mention the prices. I will say this, The Black Sea deserves better than the three tables they had on this night. It’s an excellent choice for dinner in Avalon. Let the crowds fight it out next door. Go and enjoy a really good meal in an appealing setting. I know six of us did just that.